Photography of fine art for reproduction is as much science as art. Just taking a photo will not yield a print that matches the original. Here at Colorado Fine Art Reproduction's studio we follow a rigorously controlled process to create hi-res, color correct images of your art.  Lighting the copy board evenly. By evenly we mean that the light is the same intensity (a variance of +/- 1/10 of an f-stop) over the entire area to be photographed. We measure the light in 9-12 areas from top to bottom and left to right. The lights themselves are important. Not all lighting will make good reproductions (ie electronic flash creates large amounts of ultra violet light that dramatically flavor the color of the reproduction). Colorado Fine Art Reproduction uses "North Light Products" HID plasma copy lights, made especially for photographing fine art.  Aligning the camera to the art. We exactly center the camera lens to the center of the art (both the x and the y axis) then, using a laser, we adjust the camera to a precise 90° angle, making it exactly centered and perpendicular to the art. Only in this way will the shape of the original be accurately maintained.  Photographing the color checker and art. A "MacBeth" color reference chart is positioned over the center of the art and then photographed. Using special software, this photo is used to determine precise color balance and light intensity (called a profile) for imaging all the art in the photo session. These procedures are followed for each photo session. 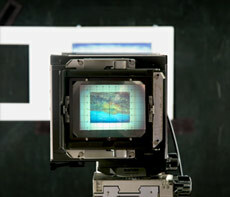 We use a "BetterLight" digital scanning back with a 4"x5" studio camera. This 384 Megapixel camera/scan back combo can produce up to a 550 Megabyte image without needing to "up size" (interpolate) the image. To better understand these numbers, think of it as photographing a 40"x50" painting in hi-res (300 dpi) and being able to print it full size directly out of the camera. Only rarely does a scan come out "perfectly". Usually some corrections and adjustments are necessary. These include, but are not limited to, overall hue and color adjustment, brightness and contrast (both overall and specific), and saturation control of both individual colors and the entire image. Colorado Fine Art Reproduction works with the artist and operator sitting at the computer together to bring all of the above factors into proper balance. This process is as much art as it is science. Just playing with values by the numbers isn't enough; it requires color correction experience, a trained eye, and understanding what the artist had in mind at creation. Knowing what questions to ask and how to ask them is important. We primarily use Adobe Photoshop to effect these changes; it contains all the necessary tools. While Photoshop has some automatic correction features, actions like color adjustment and saturation require operator input to do fine adjustments. We have been doing this type of digital adjustments since 1992, and the person doing the work is a trained and experienced professional photographer. 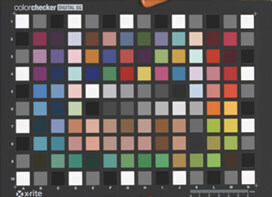 In very simple terms color management means the computer system components (lighting, camera, computer monitor and printer) are all calibrated to the same standards. They speak and understand and communicate with each other in the same language. This component interaction is vital to the process  it enables "what you see is what you get" results. 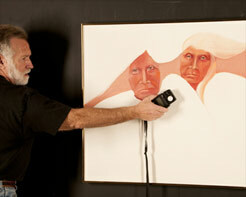 Colorado Fine Art Reproduction calibrates and profiles each piece of equipment, ensuring highly accurate reproduction. We run sample prints through the printer daily and make adjustments when necessary. 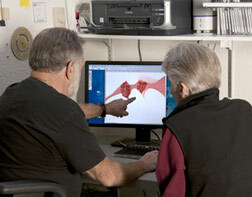 Our monitors are calibrated monthly using both hardware and software tools. The lighting is measured and re-calibrated every photo session. 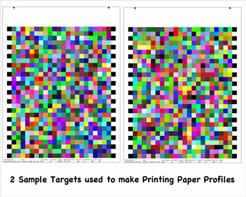 It is possible to obtain predictable and consistent results only by having a color management system established, maintained and used on a regular basis. Fine Art Printing is really easy  just press the "Print" button and a picture comes out of the machine. 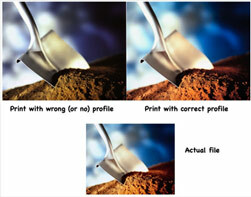 However, to print accurately and well is a real art. To produce a sellable print requires considerable effort and expense. A desktop printer with 4-5 ink cartridges will produce an acceptable print for record-keeping only, but not for reproduction; it cannot show all the colors and shades that are in the original art. 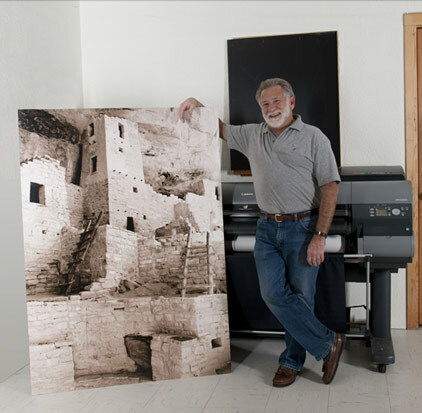 Colorado Fine Art Reproduction uses a 12 color archival printer that prints up to 44" wide. We use only genuine OEM ink (no 3rd party inks) within the expiration date on the ink cartridge. Using color management our monitor is calibrated to the printer's output  about 90% accurate (what you see is what you get). Fine tuning of the image is done by hand on an "as needed" basis. As mentioned elsewhere, fine tuning a scanned picture is more art than science. What surface an image is printed on is just as important as how it's printed. Colorado Fine Art Reproduction uses three different fine art papers, smooth, lightly textured, a "heavier toothed" watercolor paper, and museum quality canvas. Additionally we offer glossy, luster, and matte photographic papers. All our materials including finished prints are "archival", meaning they have an extended lifespan without noticeable change. However, this is partially dependent on the environment of the print - humidity, temperature and exposure to Ultraviolet light have a large effect on a print's lifespan. There is a large variety of printers on the market  black/white laser printers, printer/scanner combinations, all-in-one printers, and machines that do nothing except print. For this discussion I'd like to focus on machines that just print.  Desktop  uses 4-6 ink cartridges and can print up to 8.5" x 14"
 Medium format  depending on make and model can use up to 8 ink cartridges and can print up to 13" x 19"
It stands to reason that more colors of ink will produce a better color print -smoother color gradations and more accurate color reproduction. 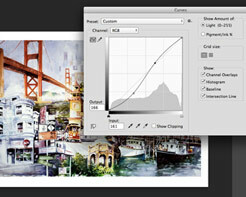 Obviously the larger printers will produce larger prints, especially important for artists who paint large. The large format printers can print on cut sheet or roll paper, rolls offering considerable paper cost savings. 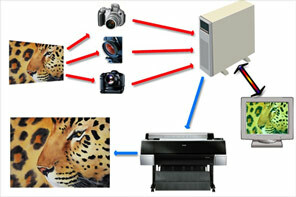 The leading large and medium format printers are Epson, Canon and HP. 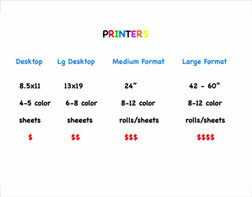 All produce acceptable prints; the differences are in printer costs, how the printer handles paper, the style and design of the ink cartridges, how many color cartridges the printer uses, etc. A word about ink  not all inks are created equal! While there are considerable cost savings to be had by using 3rd party ink (not OEM or name brand) there are also quality differences. 3rd party ink is thinner than OEM ink and can dry out sooner and more often, causing clogged print heads. Also 3rd party inks are not absolutely consistent from batch to batch meaning that your print color may differ from print to print. How long a print lasts without visible change using 3rd party inks is subject to debate; with OEM inks the print will be archival (on archival papers). 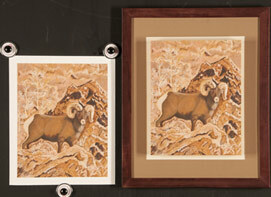 Colorado Fine Art Reproduction uses a 44" wide 12 color printer and only OEM inks. All our prints are guaranteed to be archival.